Most travel memoirs involve a button-nosed protagonist nursing a broken heart who, rather than tearfully watching The Princess Bride while eating an entire 5-gallon vat of ice cream directly out of the container (like a normal person), instead decides to travel the world, inevitably falling for some chiseled stranger with bulging pectoral muscles and a disdain for wearing clothing above the waist. This is not that kind of book. Hilarious, irreverent and heartfelt, All Over the Place chronicles the five-year period that kicked off when Geraldine got laid off from a job she loved and took off to travel the world. Those years taught her a great number of things, though the ability to read a map was not one of them. She has only a vague idea of where Russia is, but she understands her Russian father now better than ever before. She learned that at least half of what she thought was her mother’s functional insanity was actually an equally incurable condition called “being Italian.” She learned about unemployment and brain tumors and lost luggage and lost opportunities and just getting lost, in countless terminals and cabs and hotel lobbies across the globe. And she learned what it’s like to travel the world with someone you already know and love. How that person can help you make sense of things, and can, by some sort of alchemy, make foreign cities and far-off places feel like home. 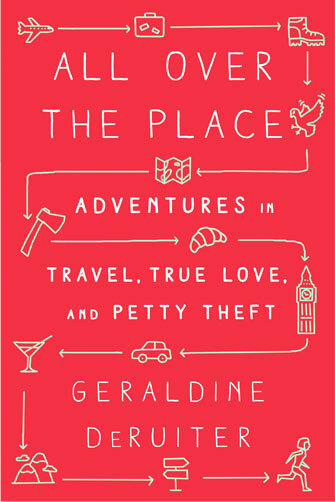 In All Over the Place, Geraldine imparts the insight she gained while being far from home-wry, surprising, but always sincere, advice about marriage, family, health, and happiness that come from getting lost and finding the unexpected. “… had me laughing so hard at times that I had tears streaming down my face” Entire review. “… heartwarming and hilarious … one of the best travel books I’ve read in a long time.” Entire review. “Side splittingly funny and deep and meaningful all at the same time.” Entire review. “I loved every word.” Entire review.